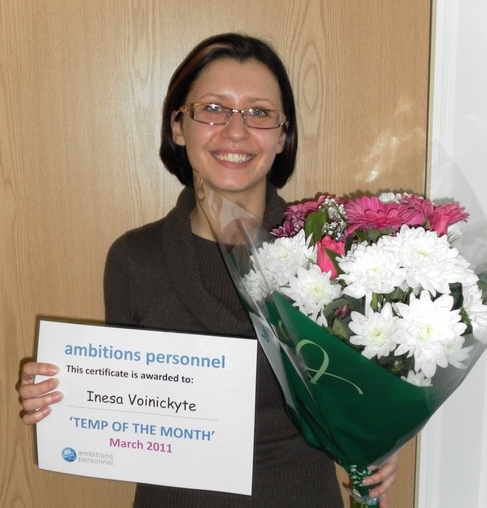 Congratulations to March’s Temp of the Month – Inesa Voinickyte from Wisbech. Inesa is a valuable employee assisting with the day to day running of a major contract, her willingness to offer help throughout the week and weekends is greatly appreciated. Inesa has proved to be a reliable member staff whom always goes that extra mile to ensure the task at hand is completed to the highest of standards. She is an excellent asset to any onsite team. To thank Inesa for her hard work, we presented her with high street vouchers and a beautiful bouquet of flowers. Pictured is a delighted Inesa collecting her gifts.